All too often, my weekdays are ruled by social media, screens, and e-mail. My focus is constantly divided between a task at hand, a moment at hand, a conversation at hand, and some incessant ping of a notification vying for my attention. 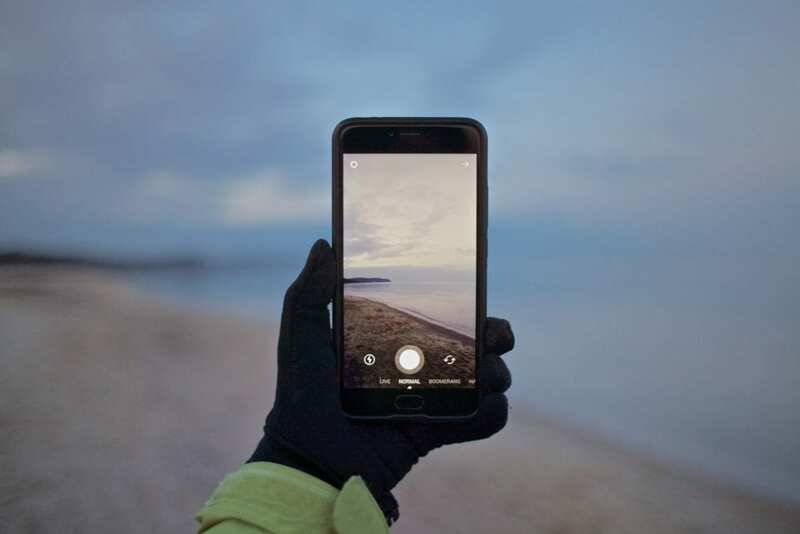 While traveling should offer respite from the tentacles of everyday digital usage, more than 74 percent of travelers use social media on trips and spend an average of nine hours on social media during a week-long holiday. In a 2017 study by Expedia, 44 percent of respondents admitted to feeling that social media ruined their vacations, while a study by Travel Agent Central showed that 65 percent of travelers confessed to using social media only to make others envious. It all starts with an “effortless” selfie at the airport. Check. You then take a slow video pan of the hotel room so that your desk-chained friends have something to drool over in between work meetings. Check. Next, you create an enviable flat lay of your Lonely Planet Iceland Guidebook and travel accessories to post to Instagram. Check. Half an hour passes and by the time you’ve thoroughly documented and captioned your arrival, you head outside and repeat the process with every view, meal, and sight. After years of traveling with an iPhone in hand, constantly documenting my experiences for an invisible audience, I choose to uninstall all social media and e-mail for my trip to Iceland. Studies show that taking a social media detox can improve everything from outlook to gaining more free time, to relationships, to headspace, to increased privacy. When my left eye begins twitching two weeks before my trip—a symptom of stress—I decide it’s time to take myself off the grid. It isn’t until I arrive in Reykjavik the following day, does the joy of being disconnected begin to dawn on me. 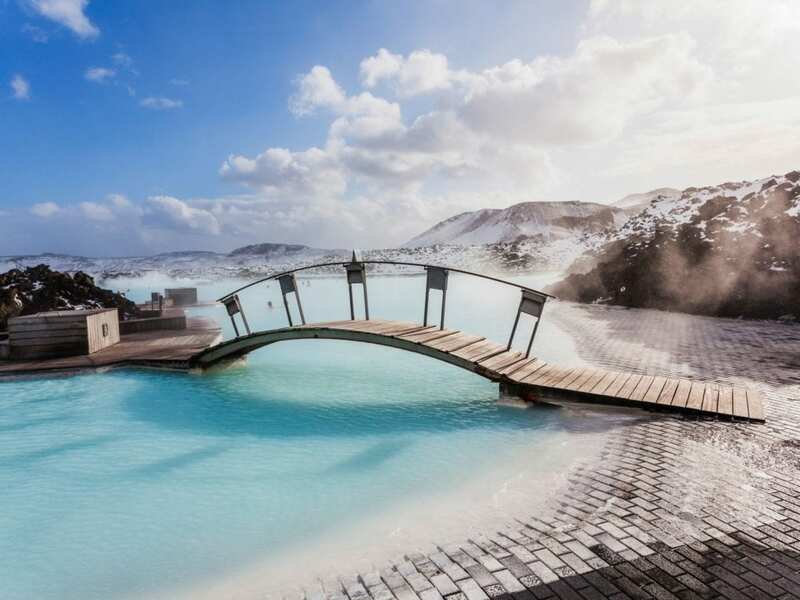 Waking up to Iceland’s colorful capital city, my partner and I start our day at the Blue Lagoon with a much-needed soak in the light blue, mineral-rich waters of the iconic hot spring. All around me, tourists are struggling to keep their selfie sticks above water as they pose with their lava scrub mud masks on. Meanwhile, I am wading through the waters allowing every sensation of the Blue Lagoon to permeate my city-worn body. I can feel the slippery, smoothness of the silica-covered lava rocks, the warm-hot sensations of the temperature-shifting water, the cold Iceland air on my face, as my arms wrap around the shoulders of the man I love. I could care less about posing, captioning, uploading, and bragging at that moment. I am blissfully and wonderfully present. Day two, and our white rental car hits the road as we drive out of Reykjavik towards the country’s Southern Coast. As we drive, we stop at highlights of the Golden Circle. We ogle at the Geysir near Selfoss, which erupts every couple minutes, shooting scalding hot water 20 feet up in the air. All around us, travelers are staring expectantly at the Geysir through iPhone screens, waiting to video the eruption rather than watch it. I have been guilty of this on countless occasions, watching bucket list moments through the screen of a phone. When the water shoots up into the air without warning, some tourists moan at frustration at having missed the shot. We keep driving—stopping at the tri-level Gulfoss Waterfall and Frioheimar tomato farm for lunch—before we spot a gaggle of Icelandic horses by the side of the road. 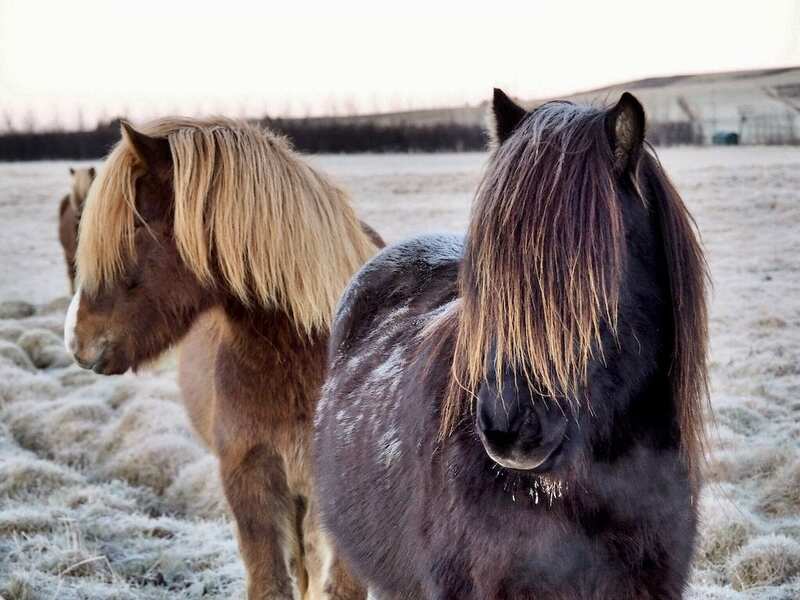 With their fuzzy, stout bodies and whispy boy band locks, the horses are cute beyond compare. We take our time petting the horses, feeling their thick winter coats, letting their velvet mouths munch “horse candy” from our hands. We take countless photos with the horses and of the horses and then tuck our cameras away. There is no need to film myself petting horses for Instagram stories, or any need to edit/caption/upload the images this very instant. It’s at this point that I remember what travel used to be like before the instant gratification of social media sharing. I remember, after our trips, how my mom would gather the family around and show us the newly printed images from her Nikon camera. One-by-one, we would look at the pictures and recall the experience or share the memory with a visiting friend. It was a simple and more meaningful ritual, one measured in connection as opposed to likes. For me and my social media-free trip to Iceland, the greatest satisfaction comes from breaking the cycle of comparison. According to a 2017 study by the Royal Society for Public Health, social media has detrimental effects on our collective wellbeing. Social media use has been linked to everything from depression to insomnia to increased anxiety, which can be due to the way we compare ourselves to others in our networks. Although we know and understand social media to be a curation of seemingly ‘perfect’ moments, we struggle with comparing what we’re doing/how we’re living to others. In response, we ‘fight back’ by posting our own curated images of a seemingly idyllic life, and so the cycle continues. Back home, I am all too guilty of letting social media get the better of me. A perfectly uneventful afternoon can be torn down by an innocuous Instagram post that conjures up feelings of inadequacy. With my iPhone now relegated to the role of GPS and radio, I am free from the shackles of comparison. Quite frankly, I don’t give a damn what location Brooke is traveling to today, how many friends Samantha is going out with tonight, or how big the diamond is on Margaret’s engagement ring. At the moment, I am blissfully unaware of how anyone else is living their life. 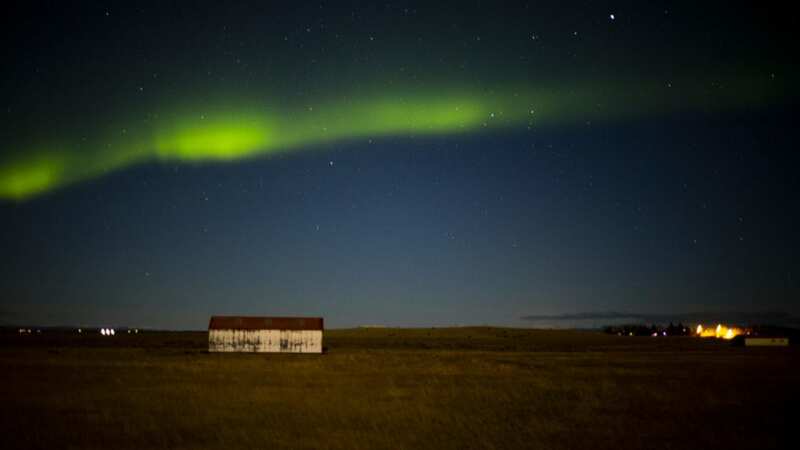 I am too busy tracking the Northern Lights with my partner in Iceland. On our second to last day, I am standing with my partner at the Jökulsárlón glacier lagoon in west Iceland. The mirror-like waters are interrupted only by floating icebergs broken off the Breiðamerkurjökull Glacier, as part of the larger Vatnajökull Glacier. The icebergs are the color of antifreeze on snow, an electric light blue twisted into odd formations. As the icebergs move towards the open ocean, curious seals bob along, peering out from the icy waters. 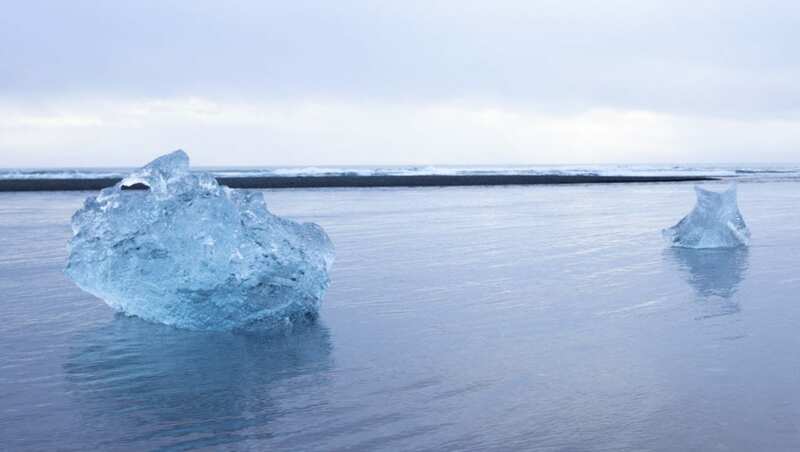 Some of the icebergs get stranded, creating what is famously known as Diamond Beach where crystal-like ice formations dot the inky black sand. I walk along the beach, my gloved hands tightly wrapped around a warm hot chocolate purchased at a food truck across the road. My partner, Jeff, takes photos with his Canon behind me, capturing the icebergs as they languidly float by. I stare down at my boots crunching along the black sand, weaving in between sparkling icebergs like stars in the night. As I venture throughout Iceland, I realize—and recognize—how self-involved social media makes all of us. The group of Chinese tourists holding a veritable photo shoot atop the stranded iceberg at Diamond Beach is unaware of the people around them waiting for their turn at a photo. The bearded hipster standing atop the Solheimasandur Plane Wreck cares little for the other travelers who hiked 45 minutes to photograph the plane. The guy flexing his muscles for a photo at the Blue Lagoon. The teenager forcefully yanking the Icelandic horse’s face for a selfie. The sleepy tourists staring at their iPhones in frustration, unable to capture the Northern Lights. We become consumed with the perception of our trips, that we sacrifice reality on the altar of it. On the plane ride back to New York, I feel a growing sense of frustration at my impending reconnection to the social media world. Oh, how I wish I could stay off the grid, but as a travel editor in New York, my social media ties too closely to my career. I see a similar frustration spreading like vines across my networks, as more and more friends delete social media accounts altogether. It’s estimated that 34 percent of young adults are getting off social media, while 64 percent are taking a break, according to a 2018 study. 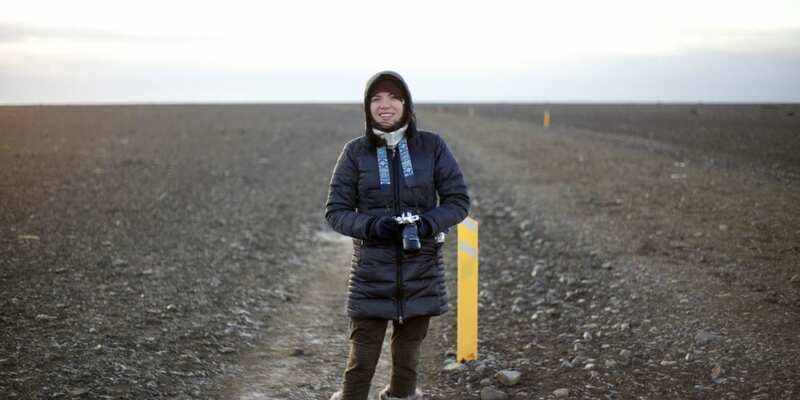 Back home in Queens, I upload my Iceland photos to Facebook and Instagram. I realize how unnecessary it is to share my trips in real-time, and decide right here and now that every future trip of mine will be social media-free. I vow to give myself the pleasure of not just being physically away, but mentally away as well. Wherever I travel next, I will jump off the social media grid as I jump onto a plane. I will not allow the melodic ping of an e-mail, Slack message, or social media notification to pull me from my travel reverie. I will allow myself to live each moment of that next trip and not measure it in the number of likes and comments received.